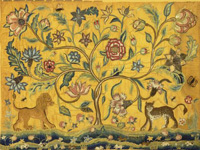 Displaying needlework or textiles as artwork is becoming very popular, and is a great way to show off exotic fabrics, handmade materiel, and family heirlooms. Many textiles are well-suited to being displayed in a frame, but special care must be taken to preserve them and prevent deterioration. When exposed to natural sunlight, high-intensity artificial light, or fluorescent light, over time textiles will fade, discolor, yellow, and deteriorate. Many textiles are valuable, unique, and irreplaceable, so Morningside Gallery takes every precaution to avoid damage over time. Specially treated archival glass is available that blocks out the worst of light’s damaging rays to protect your valuable textiles. Specially treated non-glare glass and plexiglass are also available. Many cheap mats and backers are not designed for archival quality, and contain acid and lignin that will damage your textile if used long-term. Lignin is a naturally-occurring substance in wood that will damage your textile, and is present in boards made from ground wood pulp. Manufacturers must chemically treat paper products remove lignin and to ensure that the pH balance is maintained between 8.0 and 8.5. Always use acid- and lignin-free paper products to ensure the longevity of your textiles. Your textile should NEVER touch the glass! This can cause condensation to form on your textile, discoloring and staining it and accelerating the deterioration process. To prevent this from occurring, a thick mat or spacers can be used to lift the glass away from the framed textile. Morningside Gallery is experienced in textile framing, and guarantees that your textile will be properly and safely framed.